Microwave stands provide additional storage in small kitchens as well as a convenient spot for one of the kitchen's most-used appliances. Even the smallest microwaves take up a significant amount of space, and if counter space is limited you can end up devoting most of it to the microwave. If you're looking to free up counter space taken up by the microwave, try using a microwave stand. Microwave stands can be an inexpensive way to add storage and convenience to your kitchen. Think about your storage needs as well as the kitchen layout before deciding what type of microwave stand will best suit your kitchen and lifestyle. Microwave stands come in a huge variety of styles and designs and finding one to suit your kitchen shouldn't be too difficult. Designs vary from traditional to ultra modern and can look decorative and pretty or sleek and simple. Two of the most popular materials are wood and steel and they can easily fit into many kitchen styles. Keep in mind that they can also be stained or painted to match any color scheme. 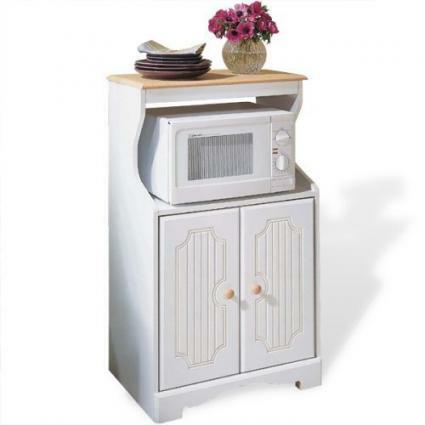 Many microwave stands have casters with wheels on the legs which makes them easy to move around the room. This is particularly convenient in small kitchens where space is limited. Depending on the kitchen layout and available floor space, a portable stand might be the way to go. They can be tucked away in a corner when not in use, or pulled out into a convenient spot when it's time to get cooking. Most microwave stands provide additional storage because not only do they provide a place to put the microwave, they have an additional drawer and/or shelf that can store things such as cutlery, cookware, cookbooks, or whatever else you may have. Depending on the size of the cart, it may also provide an additional food preparation area. If this is the case, be sure to pay attention to the top surface material to make sure that it suits your needs and is both durable and easy to clean. Before purchasing a stand for your microwave, make sure to take all the appropriate measurements. Make sure there is enough room in the kitchen to fit a stand. Stands come in many different sizes, so make sure you find the right size for the right space. Take the measurements of the microwave and make sure to purchase a stand that it can comfortably sit on. You don't want the sides of the appliance to hang over the edge of the table. Assess your storage needs before buying. Do you need an extra shelf, an extra drawer, several of each? There are several options when it comes to storage. Some stands have open storage, while some have doors that can hide what's inside. Some have static shelves, while others have adjustable shelving. Others have drawers that are great for storing small items, but won't be able to accommodate larger things like pots and pans. Think about your storage needs before buying. Most kitchen supply stores and shops that sell housewares will have some type of microwave stand available. Department stores (such as Target and Wal Mart) and home improvement stores (like Lowe's and Home Depot) also tend to carry them. Ikea will likely have a large selection, as will other retailers that carry affordable furniture. Whether you want a little storage or a lot, wood or metal, adjustable shelves or no shelves at all, they will likely have something to suit.It's also worthwhile to take a look online and see what's available. Amazon.com is an excellent resource for finding great deals on microwave stands, as are many other e-tailers that carry housewares and furniture items. Often the selection available online is greater than in-store, but keep in mind that when ordering online you'll have to consider shipping costs and possible restocking fees if you need to return the item you purchase. Microwave stands are very versatile and useful pieces of furniture. They provide extra storage, free up counter space, and can even add a stylish pop to your kitchen. Remember not to buy impulsively, rather think about your needs and do some comparison shopping first. You'll be sure to find what you're looking for and be able to make working in your kitchen a whole lot easier.